List Rules Vote up the oddest, most gag-inducing eating competitions. Competitive eating seems like a purely modern invention. Mass production and the rise of the fast food industry means that more food is readily available to stuff into your face as rapidly as possible. But in reality, weird competitive eating contests have been held since the 1800s, and some are recorded even earlier. The history of professional eating contests shows how this odd activity morphed from fringe pastime to nationally-televised sensation. Strange competitive eating contests forced contestants to overindulge in some pretty odd stuff. Sure, platefuls of spaghetti and slabs of pies are delicious, but could you swallow helping after helping of stinging nettles? How about raw meat? These foods and more all appeared at eating competitions at local fairs or big gatherings. Over time, what began as a way to have a little fun morphed into a very lucrative business for some competitive eaters. But the most bizarre of eating contests weren't about the prize money - they were about local flavor and having a good time. On April 3, 1919, a particularly unusual eating competition was held at the South Side Pavilion in Jackson, Florida. The co-owner of the Yankees, Colonel T.L. Huston decided to pit New York Yankees outfielder Ping Bodie against an ostrich named Percy, advertised as "the best eater in the world." People bet heavily on the ostrich, and the competition was going well until the tenth bowl of spaghetti. Then, Percy began to grow noticeably sick. A spectator supposedly yelled, "Do you want your bird killed?" On the eleventh bowl, Percy stopped eating, staggered off stage, and collapsed. Bodie was declared the winner, and the ostrich supposedly died. Elvers are a type of eel, and they're something of a delicacy in southern England. In the early 20th century, it was a Gloucestershire tradition to host an elver eating competition to see who could eat one pound of eel the fastest. Due to over fishing, elver numbers sharply declined in the '70s, and the eating contest had to be canceled in the mid-'80s. The competition was revived in the 2000s, when Gloucestershire residents began to import faux elvers from Spain, made of fish and shaped into "eel-like" forms. In 2016, competitive eater Matt Stonie, AKA "Megatoad," took his world record eating skills to YouTube. 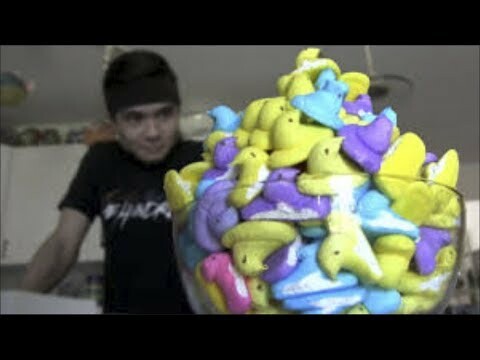 He posted a video of himself eating 200 Peeps in just over 14 minutes, which was double his previous record. The 19th century prospector Alfred "Alferd" Packer is something of an infamous figure in Colorado. He confessed to eating a group of his fellow prospectors to survive a blizzard, and ended up in jail until 1901. Decades after his death, the University of Colorado named their cafeteria the Alferd G. Packer Memorial Grill and began holding an annual Alferd Packer Day. In the '70s, students celebrated the unofficial holiday by taking part in a raw meat-eating contest. Over the years, the event has become a regular eating contest.